A roadside bomb was set off by Islamist militants on a highway in Egypt's Sinai Peninsula, killing three civilians, eyewitness have told the Ahram Arabic news website. The victims were walking on a public road in the Wadi Gamil area of central Sinai when the roadside bomb detonated, eyewitnesses added. The border mountainous peninsula has been the scene of an Islamist insurrection that has spiked since the 2013 ouster of Islamist president Mohamed Morsi and an ensuing crackdown on his supporters. 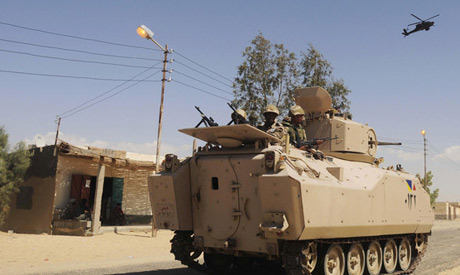 Islamist militants have targeted security forces, mainly in north Sinai, and, at times, civilians died in the process. The Egyptian army has poured troops in the peninsula as part of an extensive campaign to crush the insurgency. In its latest report on its operations against militants, the army said it has killed over 700 "terrorists" over the past six months. In a new development earlier this week, 30 tribes based in Sinai pledged to cooperate with the authorities to confront militant groups, despite the tribal community's longstanding complaints of marginalisation by the government. A tribal federation said that this would take the form of collecting information about suspected militants, as well as taking part in military operations in the peninsula.